This is not my kind of plan. My kind of plan has parts A, B, C, and D…at a minimum. This is how we’ve gotten through six years with my fragile and unusual child: Planning for anything and everything to happen. This is why I drive around in a van filled with toys, supplies, and medical equipment—ambu bag, extra feeding tube, suction, Diastat. We ride the elevator up to the main floor. The woman scanning tickets stands in front of a steep staircase. I can hear the risers squeaking under the feet of the other families arriving for the show. As she scans our tickets I ask, “I know it is general admission, but where is the accessible seating?” She disinterestedly tells me to take the elevator up to the balcony. This doesn’t put me at ease. When we pop out on the balcony, I know that these are not seats we can manage. There is a small platform on the last row of the balcony—where some of the worst seats in the house have been removed to accommodate a wheelchair. Esmé cannot see much detail more than 15 feet in front of her. She probably can’t even make out the stage from so far away—and we are here so that she can see what is about to happen. I lean over the balcony and peek below. Rows of folding chairs are laid out on the floor in front of the low rising seating below. “Can’t we just head there?” I ask the usher who greeted us at the elevator. Below us, the seats already almost full. Esmé’s first nurse, Denise, was the one who started playing Disney Junior’s Choo Choo Soul videos for Ez. Ez was around two at the time. The show featured the train conductor Genevieve singing and dancing with her breakdancing and beat-boxing friend DC. Denise said she knew how much Esmé loved shows that were all music, and how well she responded to strong beats. She’d seen the show and thought Esmé might enjoy it. Also, Denise wanted a break from the Small Potatoes clips that dominated most of Esmé’s TV viewing at the time. Esmé loved it. Sitting in her bouncer, leg braces on, she’d watch Choo Choo Soul, bouncing to the beat. Although she couldn’t stand without a lot of support, sometimes she’d bounce so energetically that I worried her tiny little body might break the thing, or fly from the harness. She’d open her mouth wide and enthusiastically vocalize back at the television during her favorite songs. The elevator pops us out on level with the folding chairs, but it is not clear where we can sit. There are a few open seats in the middle of the rows, but Ez would have to sit on our laps, it would be hard to maneuver if she needed to get out, and where would we leave Esmé’s chair? As we discuss the seating that rises up from the floor, an usher, seeing our confusion, walks over to us. I brace myself a bit, ready to explain what we need, worried she will want to send us back up to the balcony. Surprised at her instant awareness of our needs, I muster, “Oh, thank you so much!” I watch as she makes her way through the seats, people shaking their heads to indicate they cannot move—they’re saving seats, or in need of the end of the row. The usher circles all the way around the seats before I finally see a mom sitting at the end of the last row turn and look back at us and smile. She nods, lifts up her belongings, and carefully guides her daughter further down the row. The usher waves at us to come over, while she stands there, guarding our spot. After we complete the shuffle of the folding chair removal—which involves several staff discussing what to do with the removed chair now—and wiggling Ezzy’s chair into place, I turn to the other mother and thank her warmly. I ask the little girl if she’s excited for Choo Choo Soul. She smiles shyly before nodding eagerly. As soon as Esmé is settled in she already seems a bit bored. I, on the other hand, feel like I am fighting back tears. I’m touched by the kindness of these strangers and feeling excitedly hopeful that this all might work after all. Also, admittedly, I’m scanning for how best to exit quickly with Esmé, if needed. If we have to run, we will need to walk in front of the stage in order to get to the elevator. I wonder momentarily how many other of these parents reflexively scan for exits like I do. In the last six months Esmé has returned to watching Choo Choo Soul more regularly. She seems to enjoy it on a whole different level now. I’m pretty sure she is paying attention to the details, absorbing the lessons. I hear her kicking her feet to the beat when she watches it with her grandparents on their Monday mornings together. Recently one of her favorite jokes consists of us singing the ABCs to the tune of another song—like Old MacDonald. It is a silly thing her father started doing. Also, she likes Choo Choo Soul’s version of the ABC song, presumably because it has a totally different tune. I sing it to her at night—badly—and she giggles. My mother tries to sing it, but can never get it quite right, which also makes Esmé laugh. I pause. She doesn’t shake her head no…So we move. I take a seat on the floor to the side of the kids area—several feet away from the closest kid, but near enough to it that I hope Esmé feels like she is a part of the group. I set Esmé in my lap, careful to show her where her Papa is a few rows back watching us. Worried a bit about the stimulation from the knot of excited children in front of the stage, I tell her that we can go back to our seats if she feels like we are too close. Apparently in response, Esmé pushes through her feet to stand up. She stands between my knees, my arms braced at her hips to keep her upright as she leans forward toward the show, moving her body to the beat, knees locking and unlocking. Although she leans away from me, she keeps on hand in contact with my wrist the entire time, as if to reassure herself I am there. Or, as she lovingly kneads her fingers into outside my wrist, I wonder fleetingly if instead she is reassuring me that she won’t leave me. When Genevieve comes off the stage and walks through the kiddy mosh pit, singing just s few feet away from us, we inch forward, as Esmé tries to get just a bit closer to this woman who typically dances inside our television screen. She seems less impressed by DC’s presence, I wonder if she has trouble following his fast break dance moves. But once, when DC makes a joke, Esmé, laughs out loud at the same time as the other children. Then she turns back to me, still laughing, as if to ask, Did you get it, Mom? Esmé has a beautiful laugh. She laughs often at the scripted jokes we share or the silly things she shares only with herself. But in that moment, seeing her laugh at something she shares with a whole group of children, I have never, ever, been so happy to have taken her somewhere. Never, ever, have I seen her able to belong during something for her peers so quickly, so easily. The tickets were her caregiver Mayah’s idea. She sent me the link via text in November, asking if I thought Esmé might be able to sit through the show. I bought the tickets soon after. Her father and I planned to give them to her as a present for her sixth birthday in January. Uncertain of how to tell Esmé about the tickets in a way that she would be excited about, but that would also make it clear that she wasn’t going to the show right that second, we made a video. The night before her birthday André and I recorded ourselves singing the Choo Choo Soul theme song, explaining that Genevieve and DC were coming to visit soon, and that she was going to go see them sing and dance. She watched the video, curious and happy, five or six times. But I wasn’t sure if it sunk in. After the show is over we line up in the main level for our chance to meet Genevieve and DC. Other children, still wound up from Choo Choo Soul chase each other and dance around the small columns in the space. Esmé happily stood, bopped, and danced, with my support, through almost the entire show, but now she’s sitting back in her little red chair, exhausted. Her head tilts to the side. Her eyelids look heavy. She whines half-heartedly. I am not clear whether I am being a fun mother or a thoughtless mother in wanting her to wait for this experience. When DC and Genevieve walk by, Esmé barely notices, and starts hitting her cupped hands together in front of her forehead. I’m fairly certain this next part won’t go all that well. But we’ve waited this long, right? Just before it is our turn, I point to Esmé where we will be going to meet Genevieve and DC. I tell her she can be pushed up in her chair, or we can carry her, or we can help her take steps to them. Showing her the Yes and No card I ask, “Do you want to go in your chair?” No. “Do you want mommy to carry you?” No. “Do you want to walk?” Yes. It is our turn now, so I slip her out of her chair and hold her arms at the elbows, so she can push against me, as she begins unsteadily stepping in their direction. Halfway there, she wiggles out of my hands, and drops herself to the floor on her hands and knees. I expect her to roll onto her back in objection. Instead she crawls, focused, straight to Genevieve. I hold my breath, because, at this point, I’m never quite certain how a stranger will react to her. Her body is small, but not so small that it isn’t surprising that she cannot walk. Her loose joints hyperextend awkwardly. She does not respond to questions, even though she understands. There is drool on her chin. She looks so vulnerable and wild in this place, crawling on the dirty floor, but I lag behind, a watch her move forward, allowing her this small assertion of independence. Genevieve drops down to Esmé’s level to meet her. She bends over and scoops her up without a pause—like she’s been lifting her since she was a baby. Esmé looks up at her, with complete awe and adoration. And in that moment, my daughter, my peculiar, broken child, belongs. It is so exciting to be co-hosting this week’s Finish the Sentence Friday (FTSF) with Finding Ninee. As those of you who are familiar with this blog and the blog that came before this one, The Cute Syndrome, know I have been in a period of rediscovering my voice as a writer as I work to integrate the writing I do about my daughter, Esmé, and the other writing that I want to explore. And FTSF has played an important role in that discovery, for me. Each week on FTSF we receive a sentence to finish. The prompts have really helped me broaden the topics I address and let me feel free to explore new ways to tell some of the stories that are important to me. Join the Facebook Group to start linking up with all of us! The first week I linked up I wrote something that I didn’t even know I needed to write. It felt so raw and close to the bone that I wasn’t certain I wanted to share it. But I did it anyway…and I am so happy I did. Now this week I was able to participate by helping with the writing prompt: The Places I Belong Are…. I’m really looking forward to reading this week’s posts! Thanks for joining! Oh, I’m so happy that day was a success – your writing kept me wondering and I found myself getting anxious for you! Thank you also for the reminder of how powerful the kindness of strangers can be. Something as seemingly insignificant as shifting seats can be so meaningful for someone else. I felt so blessed that the other mother was willing to shift over. I wanted to hug her, but thought she might have thought me a wee bit weird…Going out to unknown events with Ez is always so anxiety inducing for me. It is such a huge relief when someone is willing to help us out in a way tat makes us feel seen, included, and welcome. I absolutely love this post! What a wonderful experience for you, Esme and Genevieve! I’ve never heard of Choo Choo Soul, but I’ll be checking to see my son enjoys it. 🙂 There’s an organization called Songs of Love that provides personalized songs for children with disabilities at no cost (https://www.songsoflove.org/). We just got my son’s song last week, and he turns when he hears his name on his song. It’s pretty cool and something Esme might like if she’s a music lover. Oh! I have heard about songs of love! That is so cool that your son can hear his name in the song. 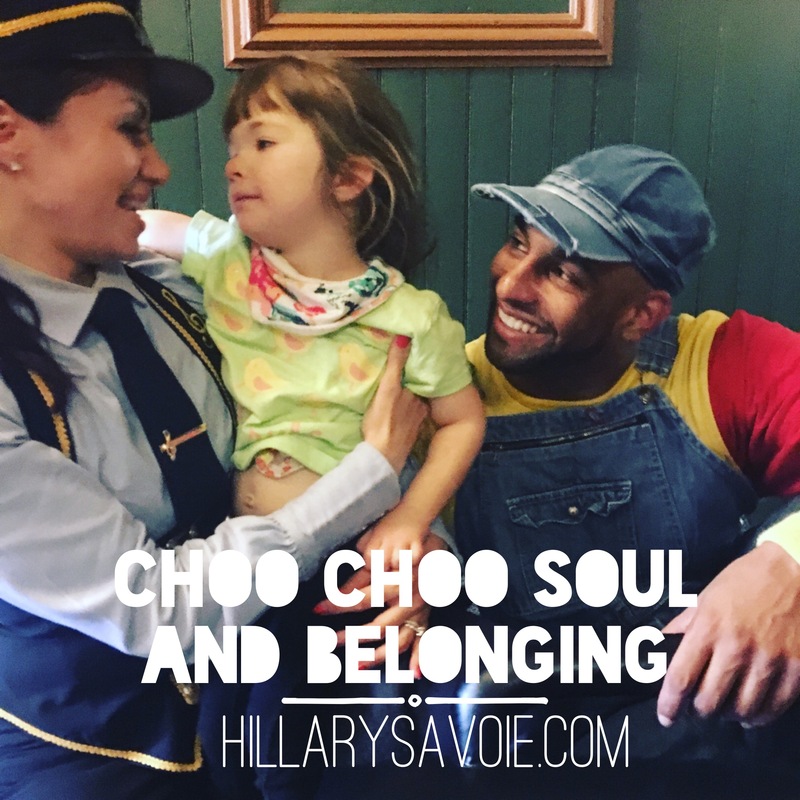 Let me know if you son enjoys Choo Choo Soul! These stories can always go several ways. You had me on the edge of my seat for you the entire time I was reading. I love the ending. I am so glad everyone seemed so accommodating for you. So happy this show was such a success and such a thrill for your child. Any happiness you can bring to them is worth all the worry in getting there. Beautiful. Glad you could host again. Thanks for reading! I was on the edge of my seat experiencing it too 🙂 It was really so wonderful to witness Esmé enjoying herself at the show. I’m thinking she might be ready to try Disney! Gosh!! Glad and relieved that it ended well. Right!? Me too!! It doesn’t always…I was ready to have to just walk out of there! Thank you for hosting FTSF and for the beautiful sentence! Thanks Nicki! I’m glad I got you weepy, LOL. It really did feel like that though…she is such a sweet child and has always found ways to show me love, even if it is subtle or unexpected. Thanks for reading and joining in! Aw… Genevieve! She was a class act! I LOVE that. To answer your wonders, I always scan for exits in crowded places – but it’s because I have an anxiety disorder! When they were younger, perhaps I needed to know where bathrooms always were, but usually it’s for my own thing. Genevieve is totally amazing. I will never, ever forget that moment. Glad to know I’m not the only one scanning exits. I’ve always been a bit anxious as a person–but Esmé has thrown that anxiety into overdrive. Thanks for commenting! Truly beautiful. Nothing beats the reward of seeing joy in your child’s face. Oh. My. Heart. Hillary, this is so beautiful – you and your precious daughter are beautiful. The kindness and compassion of strangers can be so powerful in circumstances like these. I’m so glad you all had a wonderful experience. And I have new respect for that young lady on Choo Choo Soul (which we watched endlessly when our Zilla was very small…). Bless her. Just shared on my FB page, but can’t tag you. So beautiful.